Many powerful catalytic transformations start with an oxidative addition, as is the case in the narrative of the copper-free Sonogashira reaction (Figure 1) in which the adduct of an oxidative addition of palladium with an aryl halide 1 is considered to be the main protagonist. However, in this reaction the search for its ideal “soul mate”, an actual coupling partner, has been shrouded in mystery for almost half a century. The quest of finding our “Nemo” is described in the recent article published in Nature Communications. Below is a short overview from behind the scenes. Figure 1. The Sonogashira reaction: alkynylation of aryl halide 1 with acetylene 2 into internal acetylene 3. To tackle the origin of our story, one should first look back to 2016, when we discovered and reported in Chem. Commun. 2016, 52, 1571 a hitherto unprecedented mechanism for the copper-free Sonogashira reaction that was catalysed by a rather special cationic palladium N-heterocyclic carbene complex (Pd-NHC) depicted in Figure 2. Prior to this report, the copper-free Sonogashira reaction was believed to proceed along a monocyclic, monometallic mechanism as shown in Figure 3a, i.e. via π-coordination of an alkyne reagent 2 to the oxidative adduct (formed from 1 and the palladium-catalyst) and subsequent base mediated deprotonation of the terminal acetylenic proton into the intermediate that finally undergoes reductive elimination into 3 and Pd(0), which then re-enters the catalytic cycle. However, the use of our distinct NHC ligand along with the cationic nature of the Pd-NHC complex enabled facile identification of some key Pd-acetylide intermediates in the reaction mixtures. This suggested an alternative type of activation of the alkyne reagent that involves transmetallation as shown in Figure 3b. Figure 2. Cationic bis(pyridyl-functionalized 1,2,3-triazol-5-ylidene)palladium(II) complex (Pd-NHC) from Chem. Commun. 2016, 52, 1571. Figure 3. a: The textbook mechanism for a copper-free Sonogashira reaction; b: our mechanistic proposal for the copper-free Sonogashira reaction. OA=oxidative addition, TM=transmetallation, RE=reductive elimination. The next questions came intuitively: are Pd-acetylides formed under most reaction conditions for the copper-free Sonogashira reaction? If so, are they formed with other commonly used ligands such as phosphines? A literature survey offered some easy steps to synthesise the proposed intermediates with these ligands in order to allow us to probe our questions. Both the oxidative adducts and Pd acetylides were relatively stable compounds at room temperature and their combination in a reaction mixture directly led to early success! Disubstituted alkyne Sonogashira products 3 were detected to slowly arise in the proton NMR spectra of these mixtures. Our NMR instrument, performing its role of “reaction paparazzi”, recorded several occurrences of our cross-coupling reaction subtly pointing towards a cross-coupling love triangle involving oxidative addition (OA), transmetallation (TM) and reductive elimination (RE) (Figure 3b). However, some more thought needed to be put into the mechanistic proposal to chronologically describe the story from the onset of the reaction to the final product formation. 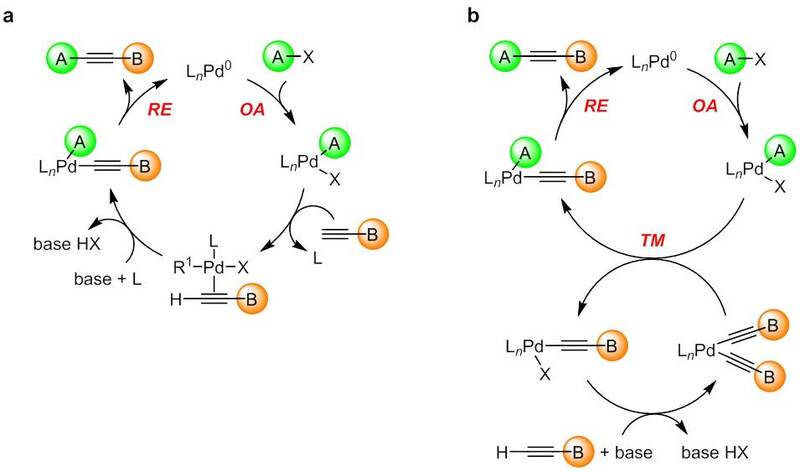 A well-balanced cooperative interplay between intermediates, kinetic investigations and DFT calculations allowed us to confirm that transmetallation (TM) is indeed a productive step in the palladium catalysed alkynylation of aryl halides. The detailed understanding of the copper-free Sonogashira reaction, more correctly referred to as the Cassar-Heck alkynylation, after the pioneers who first reported its occurrence, should allow its potential to be expanded and places it as the first identified palladium-palladium cross-coupling reaction.